Click here to listen to my Aunt Beth, Elizabeth Woolls Johnson, talk about LBJ. It's so thrilling to hear her voice again! We lost her on April 12, 2007. She was 98 years old and lived a terrific, happy life filled with teaching, family, many nieces and nephews, and travel. 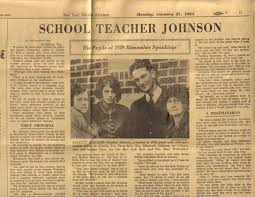 In 1928, she taught at the Welhausen School in Cotulla, Texas with Lyndon Baines Johnson. Over the years, she followed his rise to be our president and sometimes corresponded with him and Mrs. Johnson. This is Oral History: Elizabeth Johnson interviewed by Ted Gittinger about President Lyndon B. Johnson. Recorded February 19, 1986 at Aunt Beth's home on Tildon Street, Cotulla, Texas.